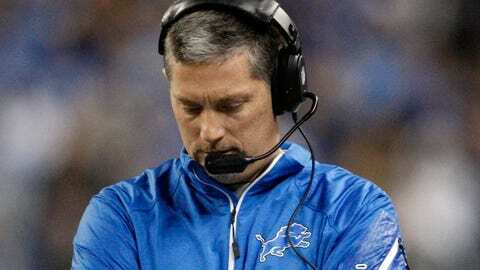 Analyst Jay Glazer reported during FOX's NFL Sunday show that Detroit Lions coach Jim Schwartz will be fired after failing to make the playoffs for the second straight year. Analyst Jay Glazer reported during FOX’s NFL Sunday show that Detroit Lions coach Jim Schwartz will be fired after failing to make the playoffs for the second straight year. "We knew it was playoffs or bust," Glazer said. "They did not make the playoffs. Ownership will meet about him tomorrow (Monday) morning. Jim Schwartz will be out." Glazer later tweeted that Schwartz’s status "isn’t definite, just feeling I’m getting is he’s out but Fords are overly patient." Other reports during Sunday’s pre-game shows were conflicting on Schwartz’s future in Detroit. ESPN’s NFL reporter Adam Schefter said that the coach is "leaning safe" for a return. Schefter also tweeted that "league sources said Lions ownership is ‘on the fence’ about HC Jim Schwartz’s job status but is ‘leaning towards keeping him.’"
Ian Rapoport, the "national insider" for NFL Network and NFL.com, reported that the Lions might be on the verge of both a coaching and front-office shake-up that would include firing general manager Martin Mayhew. On #Lions: Coaches think & fear they are out. Possible front office may be, too. By the end, the two sides were barely talking. Big issues. Note on #Lions: The word is Bill Ford Jr. is making the call on coaches & front office, not his dad William Clay Ford (the patient one). Ford Jr. is the club’s vice chairman while his father is the long-time owner.